The race is back on! Today, VH1 announced they’ve renewed RuPaul’s Drag Race for an 11th season. 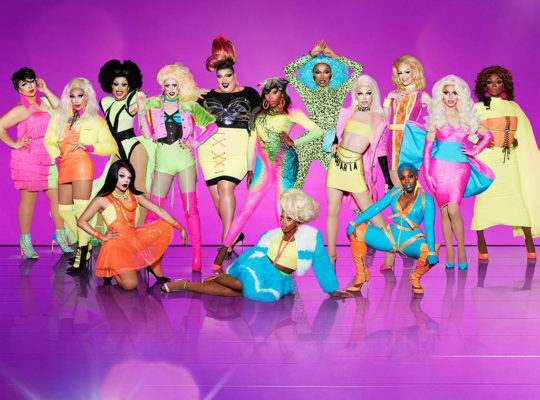 Hosted by RuPaul, the reality show eatures drag queens competing to be “America’s next drag superstar.” Previous guests have included Lady Gaga, Lance Bass, Ariana Grande, John Waters, and Kesha. NEW YORK, NY – June 13, 2018 – VH1 today announced that Emmy(R) Award-winning “RuPaul’s Drag Race,” has been greenlit for a new season, bringing viewers more sickening queens and killer lip syncs. The new season will follow a record-breaking season 10, which is currently the most watched in franchise history. Additionally, the network renewed the Emmy(R) Award-nominated aftershow, “RuPaul’s Drag Race: Untucked,” which provides an intimate look into the conversations between the queens as they await to learn their fate behind the mainstage. “RuPaul’s Drag Race” milestone season 10 is currently the most watched season in franchise history across both “Drag Race” and “All Stars.” The season is averaging 794,000 P18-49 Live+7 viewers and 1.2 million Live+7 total viewers. Tune-in on Thursday, June 14th at 8:00 PM ET/PT as the top four queens must write and perform a verse in a performance of RuPaul’s hit single, “American,” and guest on RuPaul’s podcast with Michelle Visage. Choreographer Todrick Hall, style superstar Carson Kressley and the hilarious Ross Mathews guest judge. Then, on Thursday, June 21st at 8:00 PM ET/PT watch the queens spill the tea for the season 10 reunion, and be there for the highly-anticipated finale on Thursday, June 28th at 8:00 PM ET/PT. For more information on “RuPaul’s Drag Race” and up-to-date news, go to RuPaulsDragRace.com. Follow @RuPaulsDragRace on Instagram, Twitter & Facebook for all of the latest tea and use #DragRace to join the conversation. What do you think? Are you a fan of RuPaul’s Drag Race? Are you glad it’s coming back? More about: RuPaul's Drag Race, RuPaul's Drag Race: canceled or renewed?, VH1 TV shows: canceled or renewed? I love Drag Race — glad Season 11 is coming! Very happy I never miss the show.